Confession day it is. I'm one of those bloggers who manage not just two blogs but a lot! I used to be a tad finicky about sorting my journals. And these are only personal posts and no amount of income generated, whatsoever. If my husband finds out about the madness, I have no idea how he'd react. Anyways, I have decided to shut down some of them and transport every posts here, well those that are food and travel related. I just hope that sharing the activities I did with my family is worth posting. 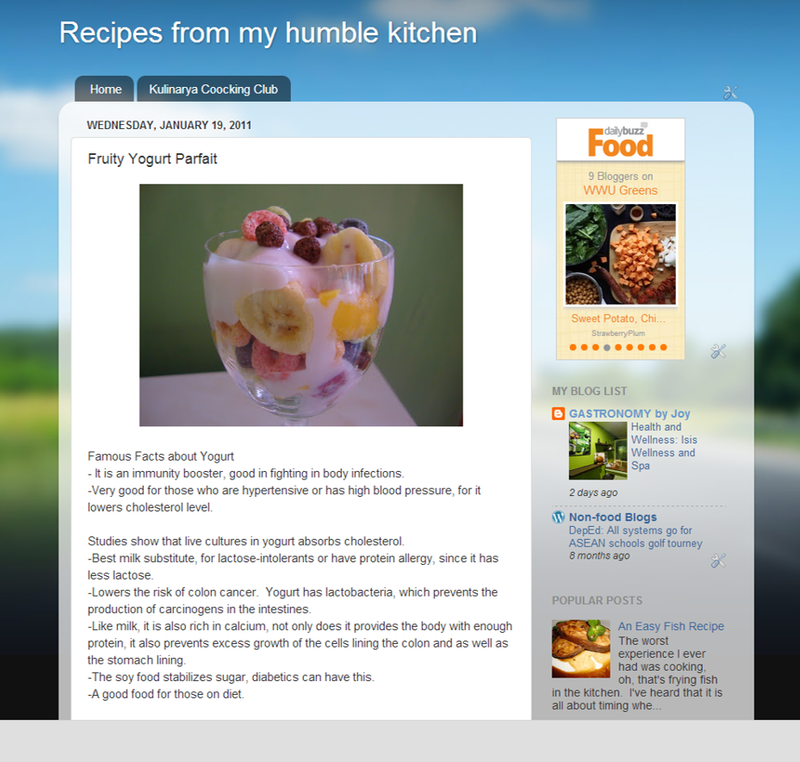 Let me know share you a post I wrote at what was RECIPES FRO MY HUMBLE KITCHEN BLOG (http://joyshumblekitchen.blogspot.com/). - It is an immunity booster, good in fighting in body infections. -Very good for those who are hypertensive or has high blood pressure, for it lowers cholesterol level. Studies show that live cultures in yogurt absorbs cholesterol. -Best milk substitute, for lactose-intolerants or have protein allergy, since it has less lactose. -Lowers the risk of colon cancer. Yogurt has lacto-bacteria, which prevents the production of carcinogens in the intestines. -Like milk, it is also rich in calcium, not only does it provides the body with enough protein, it also prevents excess growth of the cells lining the colon and as well as the stomach lining. -The soy food stabilizes sugar, diabetics can have this. -A good food for those on diet. 1. 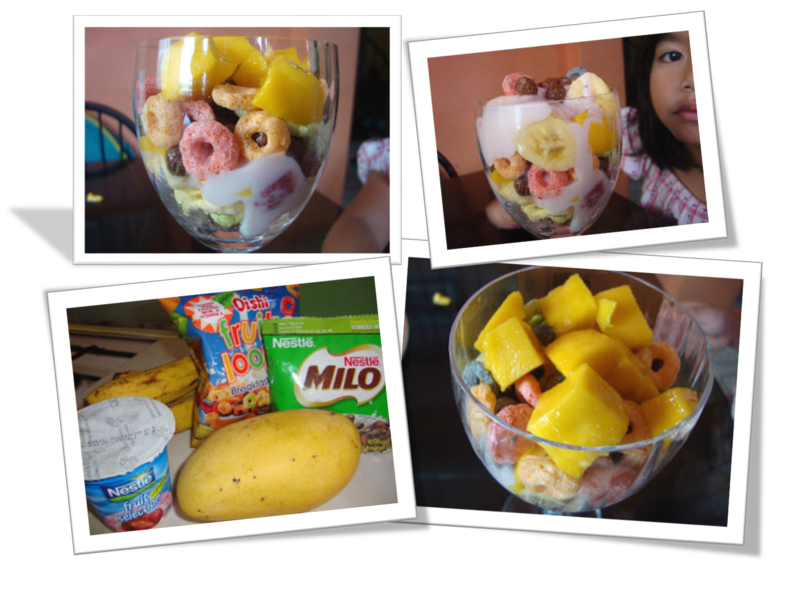 Put a few Milo and fruit loop cereals, add the magoes and bananas, top with yogurt, then another layer with the same ingredients. 2. Top it with more yogurt and bits of milo and fruit loops. 3. ENJOY the goodness of a healthy and fruity snack. This can also be enjoyed for breakfast and dessert. Variations may include ice cream or heavy whipped cream instead of yogurt. Nuts and other fruits can be added. Very easy to make, here my youngest daughter was the one who whipped this up, I just told her what to put on the glass. But I did the slicing though. FYI, this was her breakfast!